ASEA, Brown, Boveri is a Z�rich-based electrical engineering company. They have vast experience in large electrical infrastructure projects. ABB is the product of a merger between Swedish-based ASEA (founded 1883) and Brown, Boveri & Cie (founded 1891 in Baden). Both were leaders in the production and installation of heavy electrical machinery. ASEA, for example, built much of the systems that powered the Swedish rail lines and built 9 of 12 of her nuclear power plants. These days, the company is concentrating of the sort of hardware necessary for sustainable energy. China has a very large desert that could be paved over with solar cells. The problem is that these cells are a LONG ways from the big population centers. So China has to move all that energy without incurring large transmission losses. Alternating Current, the preferred technology for heavy-duty electrical transmission for a host of very good reasons, has one major flaw�it's not efficient for long-distance. As a side issue, it is almost useless for underwater power cables which becomes very important in places like Japan and Indonesia. Enter Direct Current transmission. More expensive and not as flexible as AC but it is really the only solution for long-distance and underwater. No one has a lot of experience in DC transmission but ASEA once built a link from mainland Sweden to the isle of Gotland in 1954 that's still working. And now, ABB has announced the completion of successful tests for transformers and key equipment for world�s first 1,100 kilovolt (kV) project in China. 1100 kV. Scroll down to see what kind of equipment is required to "go solar." So you�ve got this awesome car, Tesla Models S/3/X. You plug it in at night in your garage or at a local garage with an urban Supercharger, or maybe your company is enlightened and has chargers in the parking garage along with bike racks and an LRT shuttle. But where is the electricity coming from? Increasingly, it�s generated by wind, sun, or water, coming from a long way away and transiting high-voltage direct current (HVDC) transmission lines to get to you. This is one of the major trends in grid innovation I�m exploring in my ongoing series. It started with 7 Reasons the Future is Electric and has parallel threads on HVDC, blockchain for cleantech, and emerging ancillary marketsthat wind and solar can play in. So, what�s HVDC and how is it different from normal transmission? This is partially a Thomas Edison vs Nikola Tesla story. Edison was committed to direct current, but Tesla liked alternating current. Alternating current was easier to step up and down and DC couldn�t be transformed reliably, so it became the transmission and distribution standard for electricity. Edison did some ugly things to try to win the fight, but lost. Then he won economically anyway. Most long-distance transmission today is built using high-voltage alternating current, but it has some interesting limitations.
? It�s limited to 765 kilovolts (kV), which is more than enough to fry an egg. Due to the nature of alternating current, after that, voltage losses due to the electromagnetic field interacting with the insulation and heating it makes AC uneconomic.
? Most of the transmission is through elevated lines, in part due to the expense of burying lines and maintaining underground lines, but also because the heat buildup problem is worse underground and they hold more charge, which limits the distance they can transmit electricity to about 80 kilometers. The holding more charge point, capacitance, means that more energy has to be pushed into the line before it can be reversed. Overhead, high-voltage alternating current lines are kept a long way from one another and the earth, because the electromagnetic fields of individual lines interact, reducing total capacity. Underwater alternating current transmission has worse challenges than underground transmission.
? You can�t make the wires thicker than they are to get greater throughput because alternating current has a strong tendency to flow near the surface of metal conductors, so making them thicker adds a lot of weight and not much transmission capacity.
? The last bit of the challenge is that frequency is hard to change, so any alternating current transmission must be between two grids operating at the same frequency. That�s a lot of engineering compromises to deal with, but alternating current is obviously economically viable for transmitting electricity long distances, so these aren�t deal breakers in most situations. Until 1954, there was no real alternative to this set of compromises. That�s the year that the problem of reliably changing the voltage of direct current up and down was cracked. ABB, a major player in this space, built a submerged 96 kilometer HVDC transmission line between the Swedish mainland and an island. Direct current doesn�t have most of the limitations of alternating current for transmission.
? While it�s limited to about 800 kV, not dissimilar from AC, the way it�s constructed you effectively get double the voltage of AC.
? Underground and underwater lines don�t lose effectiveness for transmission compared to aboveground lines. No electromagnetic field is created by direct current to interact with other wires, the ground, or water.
? The wires can be arbitrarily thick because direct current doesn�t tend to flow along the surface.
? Direct current has no frequency, so it�s easy to connect two grids at different frequencies and use electronics to match frequency when it�s converted back to AC. HVDC is sometimes referred to as asynchronous transmission for this reason. But direct current has still had two limitations that prevented it from taking over the world, at least until recently. The first is that the voltage converters were a lot more expensive than the simple, physical alternating voltage converters. DC converters are electronic in nature, and as I pointed out in the 7 Reasons article, Electronics outperform the physical. That�s true in this case too, with DC transformers plummeting in cost. If you look around, almost every electrical device you can see runs on DC internally and the power blocks convert AC from the plug to DC for the device. That�s been made cheaply possibly by electronics, and it�s true for transmission-scale transformers as well. The second problem is that circuit breakers for high-voltage direct current were ineffective. Circuit breakers are components that protect electrical systems from excess current. If you have an older home, you probably have a fuse box. If you have a newer home, you probably have electronic circuit breakers, typically a row or two of black switches in a panel. Mechanical breakers for DC were too slow while semiconductor breakers were fast enough but had 30% power loss. This has been hard to overcome, but it�s been licked recently with a new generation of hybrid breakers. HVDC lines always deliver more of the power put into them regardless of the distance that the electricity travels. But the big reason this is important is that it�s cheaper at longer distances and at very short distances underwater and underground. �Over a certain distance, the so called �break-even distance� (approx. 600 � 800 km), the HVDC alternative will always provide the lowest cost. The diagram is interesting. DC terminals will always be more expensive than AC terminals simply because they have to have the components to transform DC voltage as well as convert the DC to AC. But the DC voltage conversion and circuit breakers have been dropping in price. The break-even price continues to drop. Right now on modern grids, transmission losses are 7% to 15% with aboveground transmission. With DC transmission, they are a lot lower, and they remain low if you run the cables underwater or underground. That last point is worth drawing out a bit, as it�s directly related to the use of HVDC for renewables. A key element in the successful use of renewables is continent-scale grids. Energy has to flow from low-carbon hydro in areas with low biomass far north, far south, across deserts, from areas with lots of sun nearer the equator, and from wind offshore or in windy plain areas to large urban and industrial areas. In the USA, the best wind and sun resources are in places a long way from most of the people. With alternating current, that means huge towers and lines marching across long distances. And that means a lot of people protesting because they hate change, they don�t want their views spoiled, they think that their land is somehow special and shouldn�t have a tower on it, or because they have an irrational fear of the electromagnetic spectrum. I�ve written a lot about NIMBYs in the past � in fact, the article linked was my second article ever on CleanTechnica and published close to 4 years ago. Much of what I said holds for transmission projects as well. HVDC holds the promise of being able to dodge this problem in a lot of places. Where it�s impossible to overcome local outrage at the thought of big metal towers, it is possible to bury the line for a few miles. It�s more expensive, but it�s a way to dodge a lot of the problems. And the last thing you can do with HVDC that�s interesting is that you can string it on existing AC tower paths, effectively making your existing, accepted transmission route deliver a lot more electricity to highly populated areas. That typically avoids NIMBY complaints too. The other place this makes a difference is for populaces spread over islands. Indonesia is a good example. It has 261 million people living on 6,000 of its 17,500 islands. And a lot of those islands depend on oil and diesel generation. Japan is similarly challenged. While most people think of it as a country, or if they know more think of it as three or four big islands, it actually has 6,852 islands with 430 of them populated. Japan is looking at two major HVDC power links to Asia to enable it to break free of its need to generate and manage all of its own electricity in a limited geographical area with significant terrain challenges. And lots of people think of the British Isles as a few big islands, but it�s actually well over 6,000 islands with close to 200 permanently occupied. Denmark has a mainland, but also 1,000 islands with 70 of them inhabited. This pattern repeats itself globally. Remember that HVDC doesn�t lose effectiveness when submerged, unlike AC transmission. Remember also that renewables are more and less effective in different places, often different places than the people who need the electricity. And remember that offshore wind energy has one of the highest capacity factors available, with 50% as a usual number and 60% not unusual. When HVDC pays for itself with lines 50 km long, the HVDC revolution of cheap transformers and effective breakers starts to look like a miracle. So that�s HVDC and why the electricity you use will increasingly come through HVDC transmission. It gets more power delivered over longer distances, it�s increasingly economically viable, it works better underground, it works better underwater, it can dodge NIMBYs, and it reduces the challenge of variable renewable generation. It�s one of the top innovations in the world of electricity, and it�s coming soon to a grid near you. Future articles will look at specific projects, take a closer look at the economics, and explore some of the factors touched on in this article in greater depth. The set of innovations that have led to HVDC transmission being increasingly competitive and effective in places where AC is less effective are going to enable greater growth of renewables globally. ABB has set another pioneering innovation record with the successful testing of the low and high voltage units of the world�s most powerful ultrahigh-voltage direct current (UHVDC) transformer. The +/-1,100 kV (1.1 million volts) UHVDC transformer, developed and manufactured in close collaboration with State Grid Corporation of China (SGCC), has successfully passed a series of type tests, paving the way for the implementation of the Changji-Guquan UHVDC link, which will transmit power from the Xinjiang region in the Northwest, to Anhui province in eastern China. Changji-Guquan, the world�s first +/-1,100 kV UHVDC link will set a new world record in terms of voltage level, transmission capacity and distance. It will be capable of transporting 12,000 megawatts of electricity - the equivalent of 12 large power plants and 50 percent more than the +/- 800 kV UHVDC links currently in operation. Transmission distance will be extended from around 2,000 kilometers (km) to over 3,000 km, enabling the integration and transmission of remote renewables on a much larger scale. When fully operational this UHVDC link will be able to feed eight 500 kV and two 1,000 kV AC lines � delivering power equivalent to twice the average annual power consumption of Switzerland. ABB�s latest breakthrough also makes it possible to connect +/-1,100 kV DC with 750 kV UHVAC links for the first time. 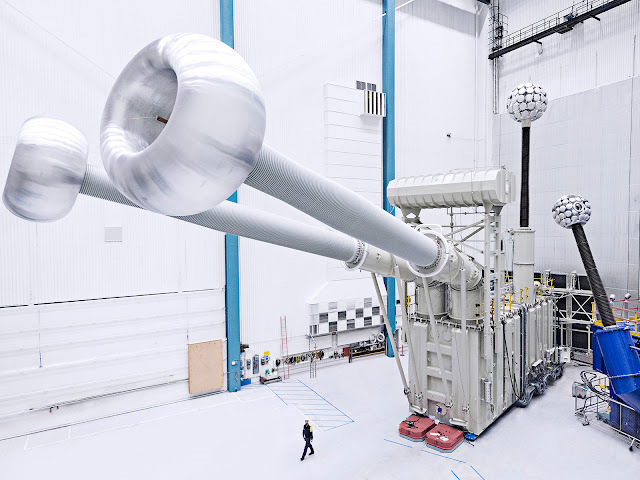 In addition to the transformer, ABB has also developed and successfully tested a range of other key +/-1,100 kV components, including converter valves, bushings and DC circuit breakers. �In addition to transporting more power across longer distances with lower losses, this breakthrough will enable the interconnection of AC and DC grids and support the future linking of regions and countries.� said Claudio Facchin, president of ABB�s Power Grids division. �It reinforces our pioneering technology leadership in HVDC transmission and reaffirms our close collaboration with SGCC, as we enable a stronger, smarter and greener grid�. �The Changji-Guquan +/-1,100kV project is a major technical step-up making it the world�s highest DC voltage. The transformer is a key element of this link and we are pleased that the first of these landmark transformers have passed critical tests and exceeded expectations. I would like to congratulate the teams from ABB and SGCC on this successful achievement� said Mr. Liu ZeHong, Executive Vice President, SGCC. China has major consumption centers in the east, while a significant amount of its energy resources are in the west and northwest. The expansive geography and increasing demand have prompted the build-up of ultrahigh voltage links to increase transmission capacity while minimizing losses.